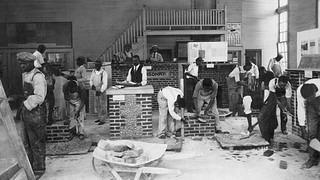 Brick masonry class at Tuskegee University, 1928. 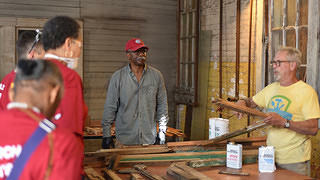 The Tuskegee University Robert R. Taylor School of Architecture and Construction Science, in partnership with the National Trust, National Park Service’s National Center for Preservation Technology and Training, Preservation Trades Network, and Alabama Historical Commission, is hosting a two-day historic preservation workshop on Friday, August 24 to Saturday, August 25. The development workshop is intended to teach students, university officials, community members, and preservationists valuable skills, including: photogrammetry (photography and drone technology); documentation workflow; window restoration; brick repointing; and laser scanning. 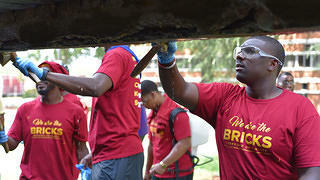 Participants working on the school’s historic buildings—many of which were designed by Robert R. Taylor, the first accredited African American architect, and constructed by students almost a century ago—have an opportunity to directly connect to and continue the legacy of Tuskegee University’s architects and builders, while acquiring advanced preservation trade skills that will make them competitive in their professional career paths. Funded in part by the National Trust’s African American Cultural Heritage Action Fund, the Historic Preservation Workshop highlights the nationally-significant contributions of Tuskegee University, the only Historically Black College and University (HBCU) campus to be designated a National Historic Site. Participants spent two days learning skills such as window restoration. 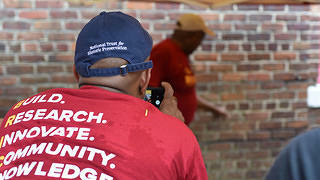 Photogrammetry and brick repointing were among the many preservation skills taught to participates.